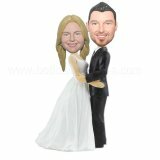 Custom bobblehead of a couple that the groom took off his jacket on his one arm and the other hand on the waist of his lovely wife.The custom bobblehead bride is in very nice red and white attire standing elegantly and sporting a sweet smile.It’s perfect gift to the newlywed couples with sense of humor. 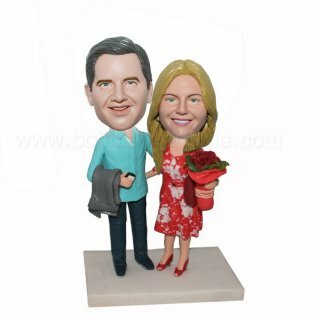 It’s also an ideal option for a wedding cake topper. This custom made bobblehead will definitely a unique artwork to decorate a wedding cake. Absolutely fantastic. The process was easy and I received it much faster than I thought. I'm thinking of having another one done for my cousin and future husband. Thrilled and very happy.